The online Atlas of Community-Based Monitoring in a Changing Arctic maps projects and networks around the Arctic and subarctic, displaying basic information about the different kinds of phenomena being monitored, methods used, geographic range, and time frame of monitoring. 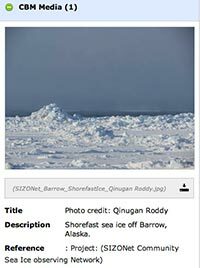 The atlas is being developed by the Inuit Circumpolar Council-Canada in partnership with Brown University, the Exchange for Local Observations and Knowledge of the Arctic (ELOKA), Inuit Tapiriit Kanatami's Inuit Qaujisarvingat: Inuit Knowledge Centre. The atlas will interface with the Sustaining Arctic Observing Networks (SAON) program to help community-based monitoring projects connect with one another and become a more defined network. A secondary phase of the project will involve in-depth interviews with CBM practitioners to identify best practices and challenges. AOOS and Alaska Sea Grant are content partners in this effort, contacting programs and gathering data for the atlas. This information will also be available soon through the AOOS Arctic Portal, where the information may be displayed alongside other realtime, satellite and project data. Information on communities and community-based projects is entered into a database and displayed on a map of the circumpolar north. The atlas can be searched in a number of ways, including by keyword (such as "birds" or "ice"), by community, or by project name. For example, you can search on "Ketchikan" to find projects in Ketchikan, Alaska. The atlas has regional views, including a State of Alaska view. For this and other views, click on the "Focus" tab at the top of the page. In any view, you can click and drag to move the map to a particular area, zoom in using the "+" button, and then click on a yellow circle or blue square for more information about a community or project. The atlas collects and makes available a wealth of information about community-based monitoring initiatives, including what is being monitored, what concerns prompted the establishment of the initiative (for example, biodiversity loss, climate change, or contaminants), whether and in what ways traditional knowledge is part of the initiative, and how data is collected, stored, and shared. It also links to project websites where in some cases, monitoring data is made available to the public. 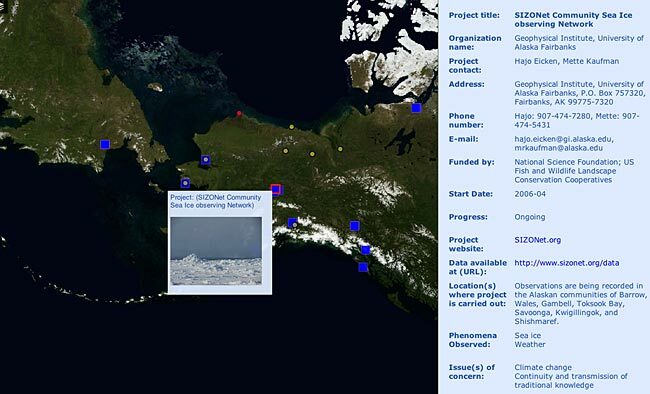 Information on monitoring networks, such as the Bering Sea Sub-Network (BSSN), may include a clickable list of participating communities. Photos or videos and other media are also available for some projects and networks. Perhaps the easiest way to explore what the atlas has to offer is to pick a region and simply begin clicking on points. If your program is not already in the atlas, we encourage you to submit it now! Program information submitted by March 14th will be included in a workshop session on Wednesday, "Summary of Alaska statistics from Atlas of CBM in the Arctic." To submit your information to the atlas, visit the atlas website and click on "how to join" under the "About" tab. From that page, you can download a Word document that you can email to atlas organizers. Last modified 5 February 2015, 2:47pm AKST. For website issues, contact Alaska Sea Grant web coordinator.